This large shorebird with a long down-curved bill and conspicuous head stripe breeds on inland tundra in a small area of western Alaska on the lower Yukon River and the central Seward Peninsula. 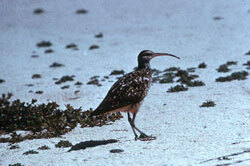 The bristle-thighed curlew (Numenius tahitiensis) nests on hilly, inland tundra, often placing their lined depressions directly beneath dwarf willow shrubs. Following the breeding season, most bristle-thighed curlews congregate on the Yukon Delta, where they feed on berries, insects, and other food in preparation for a non-stop, 2,500 mile flight to their wintering grounds on Hawaiian Islands and other sites in the South Pacific. Nome – on Kougarok Road, the birds typically gather along a ridge on the opposite side of the road from Coffee Dome, a dark-colored hilltop at Mile 72. Another nesting site is near the end of the road at Mile 84, but it involves a strenuous hike and little chance of success. St Paul Island – a wide bay near Webster House or near the end of Northeast Road may be a good spot to see the curlew in May. Cold Bay – have been recorded here.